Sometimes when I am in the thick of things as I navigate family life, it is easy to get discouraged and distracted. But if I step back and evaluate how I am doing at the simple, but most important aspects of family life, it is easier to see clearly how to refocus my efforts in the areas that need the most attention. 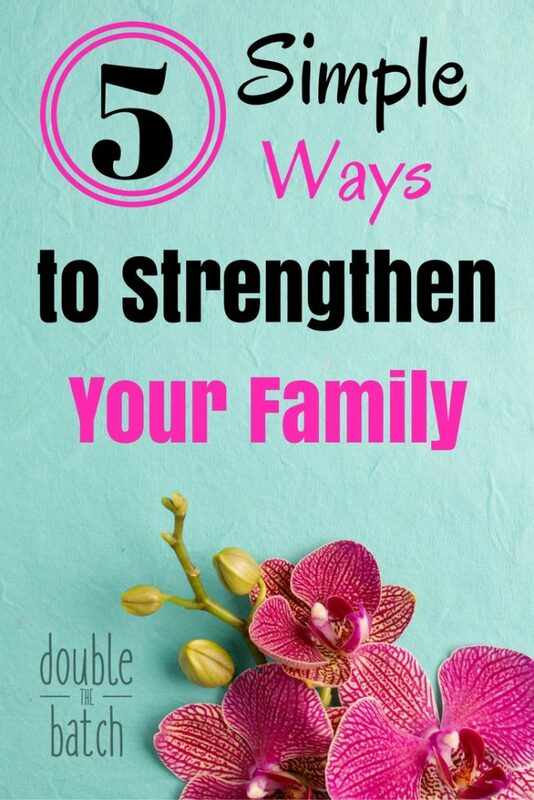 So, I am writing this post to remind me of these 5 simple ways to strengthen my family as a reference for when I start getting discouraged and distracted again. I just know that when I am doing these 5 things, life is better around our house. And because my mom worked hard at doing these 5 things, I know from personal experience how beneficial they are in the long-term for my kids. 1- Set aside one night a week as a family night. Cut out all the other distractions that tear you all in different directions and take some time to be together as a family. If you find that it is impossible to find one night a week where everyone can be home at once, well, you are packing yourself too tight. It might be time to look at what you can cut out to allow more time together as a family. All the extracurricular stuff is nice, but in the long-term, your time together is more valuable and important. Scale back if you have to to make this happen. Then, put away your screens and interact with each other. Play a game. Talk. Go to some kind of special event together. Make memories on a weekly basis. These nights will be the nights your kids remember more than any sporting event or dance recital as they get older, and they will have a greater impact on their lives. 2- Eat dinner together as often as possible. I have talked about this before, but I feel like I can’t say it enough. Families who sit around the kitchen table and eat together on a regular basis feel more connected. Make the time around that table meaningful. Talk about what happened in everyone’s lives that day. Look for opportunities to teach the principles you value most in casual ways. Listen to your kids more than you talk. This is a great time to really get to know your kids and how they are perceiving the world around them. Studies have shown there a huge benefits for kids who eat dinner as a family regularly. It seems to give them a feeling of belonging in the family that prevents them for acting out in and myriad of negative ways to find that belonging elsewhere. Make this a priority, as hard as it is with everyone running in all directions. It will pay off in a big way if you do. 3- Make time for family vacations every year as a family. They can be stay-cations if money is tight. My mom always said they bought used cars and used furniture so that they could afford to take us on family vacations on a teacher’s budget. I am so grateful they understood what was more important in the long term. We all need a break from the mundane or stressful parts of life every now and again to reset and find our center again as a family. Vacations are memory makers. They stick out from the routine and give your family a chance to interact in new ways. Make them a priority give your children a mind full of fun and happy memories to look back on. 4- Support each other. Teach your kids to be each other’s biggest cheerleaders. Go together to games and performances and cheer each other on as much as possible. Sometimes you will have to divide and conquer, but this is another reason to not spread yourselves too thin. Try not to be so over-committed in so many areas that you are never there to support each other. Help your children choose the things they are truly passionate about and cut out the things that might look good on a resume or to your neighbors, but are not really adding value to their life. Do the same for yourself as you are presented with opportunities to be involved in things. There is a season for everything and we make ourselves miserable when we do too many things out of season because we feel pressured or guilty for saying no. Remind yourself in your mind that, often, saying no to many of the good opportunities that arise is also saying yes to your kids who need you while they are young. They will be out of your house before you know it and you can say yes all you want then, but your time with them is precious and the priority right now. I am not saying you shouldn’t be involved in anything. Of course, you should, but carefully and thoughtfully choose those things that are of real value and importance and turn down the rest. 5- Pray together as a family. Teach your kids to pray for each other as they listen to you pray for each one of them. Feelings of love and belonging will flow from this. Start and end your day on your knees together. This is a tough habit to keep up, I know. But never stop trying. That is something I appreciate about my mom. I wouldn’t say that we were perfect at doing the things that matter most as a family, but she never stopped trying to make these things a priority in our family and, in the long-run, her persistence made a huge difference in each of her children’s lives. I will be forever grateful that she understood what mattered most and never gave up. I’m going to keep trying to do the same.